"You have cancer," can be the most devastating words one can ever hear. Tragically, cancer continues to assault and afflict vast numbers of families. But for many the experience of cancer becomes a time of finding God's presence in a deeper and more beautiful way! This series of meditations on The Lord's Prayer with Ken Curtis builds upon his previous series, Reflections on Psalm 23 for People with Cancer. Ken was diagnosed with advanced cancer with little prospect for survival. He pursued a combination of traditional and alternative medicine, undergirded by a strong spiritual dimension and prayer support team. While made particularly for people facing the crisis of cancer, the reflections are relevant for any health crisis. 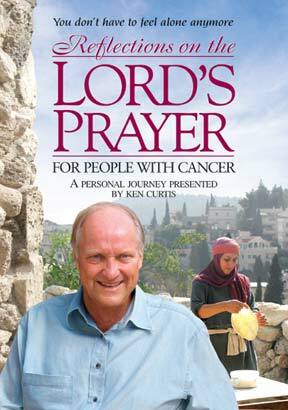 Join Ken on this journey into the world of The Lord's Prayer from original locations important in the life of Jesus. The Lord's Prayer is not just a way of praying. It's a way of "seeing." When the prayer is grasped and uttered from the heart, it can -- and will --change us. We realize how we are not alone, no matter how difficult or seemingly hopeless our situation. Even in our pain, there can come a joy and a feeling of rightness about our world. A co-production of Vision Video with EO-TV Holland, UCB-TV England and Nazareth Village. Dr. Ken Curtis is founder and president of Gateway Films/Vision Video and Christian History Institute.